I am seeking to fix a very small (but significant) typo in summation indices for this answer. In particular, in the last two equations of the post, the summation should start from $i=1$ instead of $i=0$. This means there is a non-trivial and meaningful edit for the post that consists of exactly 2 characters. Why is there any type of minimum edit length for a type of site (a mathematics site) in which even 1-character edits might be hugely significant? How can I update just the two summation indices in the answer, and no other characters in the answer? 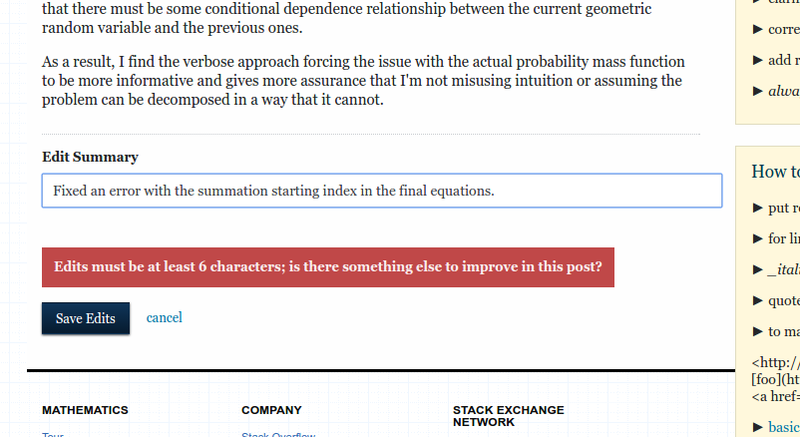 Browse other questions tagged discussion mathjax editing suggested-edits character-limit .